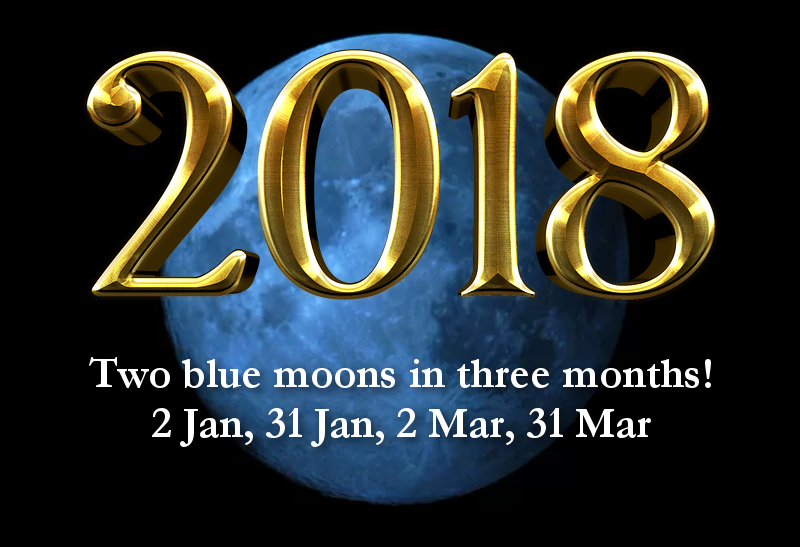 2018: two blue moons in three months! As we begin to welcome in 2018, we know we will be met by a lunar wonder of two blue moons in three months as the moon is full in the UK on January 2nd & 31st, and March 2nd & 31st. Nope, there’s full moon in February this year. For those in later time zones than the UK, the dates are January 1st & 31st, and March 1st & 31st. Slap bang in the middle of this is the Chinese New Year, moving into the Dog on February 16th. Even more appropriate at this time it is the element of earth, so it is the Earth Dog! The first full moon of the year will be in the sign of Cancer. at eleven degrees (opposite the Sun in Capricorn. The second will be on 31 January, when the (blue) Moon will be full in Leo, opposite the Solar king shining in Aquarius. March will see the moon full in Virgo at the start of the month and Libra for the second blue moon of the year on the 31st. These time markers will give us a great point of reference to work on our rebuilding, rebranding and resolution. The Cancerian full moon is one of love, Cancer is guided by the moon, the oceans and the intuition. With a Capricorn sun and Venus offering assistance- the head and the heart will square off in a battle for love. Self-love. I never thought I’d say this, but it is set up for new year’s resolutions- of self-love, self-care and self-determination. This is a year for building ourselves from the bottom up and the work from the past couple of years will act as a accelerator for change. You may have had tough years, you may have had things happen that don’t even feel like a lesson- but that is going to serve you now. Letting go of things now has built you up to this point. So, even if you have a heavy heart at this time in your life, take my hand and let’s walk through the new frontier of 2018 with so much to gain.